Have you ever suffered from a dropped camera? Fewer feelings in the world are more sickening. The dread is overwhelming, and it seems like the few seconds it takes for the camera to hit the ground takes forever, yet you're helpless to prevent it. And you already know that no amount of time spent with Photoshop can fix a broken camera. Even though you're afraid to do it, you do have to pick up the crashed camera at some point. And your natural instinct is to press the power button immediately, checking to see whether the digital camera survived the fall. 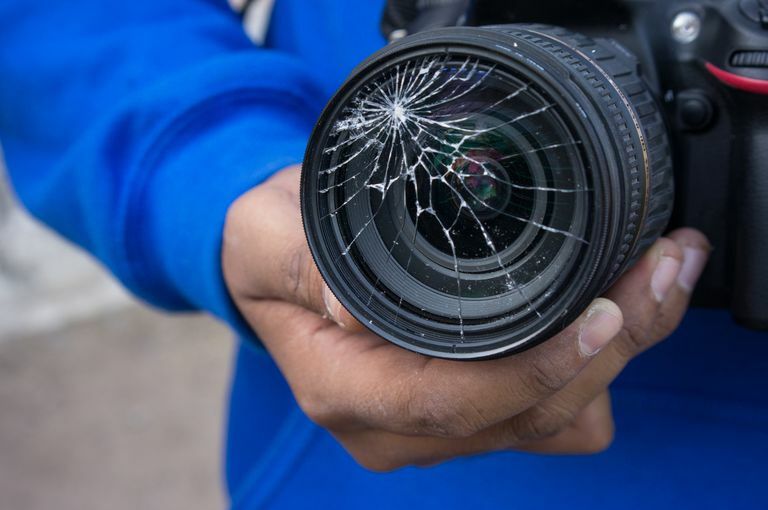 If the digital camera doesn't work or if it appears to be working in a manner different than what you're used to seeing, keep the panic at arm's length for a few more seconds, and look at these items for potential easy-to-fix problems. Check the battery compartment. It's common when you drop a camera that the weakest point of the camera body will absorb much of the impact. For many cameras, this is the battery compartment door, which may pop open during the fall. Some cameras will not operate properly if the battery compartment is open. Along the same lines as the above tip, is the battery still in place? The camera won't work if the battery popped loose in the fall, which can occur. Is the memory card seated tight? As with the battery, a jolt to the camera could pop the card loose, although this is less common than a loose battery. And while most cameras will at least turn on when the memory card is loose or missing, some won't, so be sure to check this potential cause. Take a close look at the buttons and dials of the camera. Are they set as they normally would be? A bump to the camera could twist a dial to a setting you never use, making it appear as though the camera isn't working properly. Looks closely at the buttons to make sure one isn't jammed to the point that it's always on. Is the camera body sprung? Some models are designed to absorb a major shock by popping an exterior panel slightly loose. The camera may not work properly if a portion of the camera's body is loose. Most of the time, you can snap this loose piece back into place if you do so carefully. A loose panel on the camera body is different from a cracked panel, which can cause light to leak into the camera's interior, causing improperly exposed photos. Once you have checked for common problems after a camera drop, go ahead and try the power button again with your fingers crossed, while still holding the camera properly, of course! If you seem to have a lot of problems with dropping your camera, you may want to consider one of the best waterproof cameras, which also nearly always have a tough exterior, allowing them to survive a drop of several feet. These cameras don't excel in terms of image quality typically, but they will not leave you with that sickening feeling if they slip through your fingers.